Starting next year, passengers on Toronto’s Union Pearson Express owning a smartphone can buy and present a ticket using their device, thanks to the adoption of a new app from New York-based Bytemark, reports ITWorld Canada. 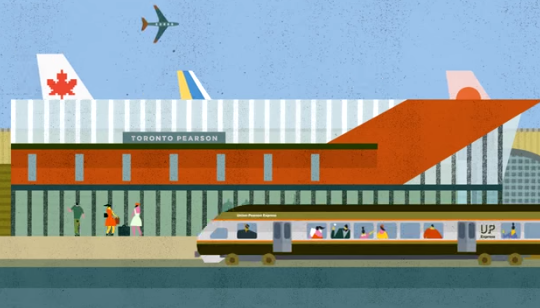 The Union Pearson Express aims to transport roughly 5000 people on a daily basis between Union Station, located in the heart of the city, and Toronto Pearson International Airport. So next spring, when you arrive in Toronto, just take your iPhone and use the app Bytemark has created to buy a ticket – you can do it online, as well – and choose to print it out or just present it on your iPhone, so mobile ticket validators carried by the staff can scan it. Unfortunately, the system is not compatible with the NFC-based card used on the Metrolinx Go network (Metrolinx is a government agency operating the Union Pearson Express, and covering regional transport). The Presto-card is now being rolled out on the Toronto Transit Commission’s urban subway system. This is the first mobile ticketing system Bytemark has launched in Canada, but it expects to close other deals in the country over the next few months. Now, it only remains to be seen when Canadians will be able to use their iPhone 6 to buy a ticket.